When we buy Zuni and Navajo fetish carvings and aren’t positive about the stone used, we ask and are often told “serpentine”. You might think that is a catch-all category but when you really look into it, you’ll find that serpentine comes in a wide variety of colors. It is one of the oldest stones used for carving, as early as prehistoric times. Serpentine can range from green to pink and everything in between including tan, brown, red, black, yellow, gray and more. A very popular and traditional stone “fish rock” is actually serpentine. It is a light stone usually with small splotches and veining. Here are some examples of fish rock serpentine. Ricolite is another serpentine that is dark green with grey or light green bands. Here are some other examples of serpentine. 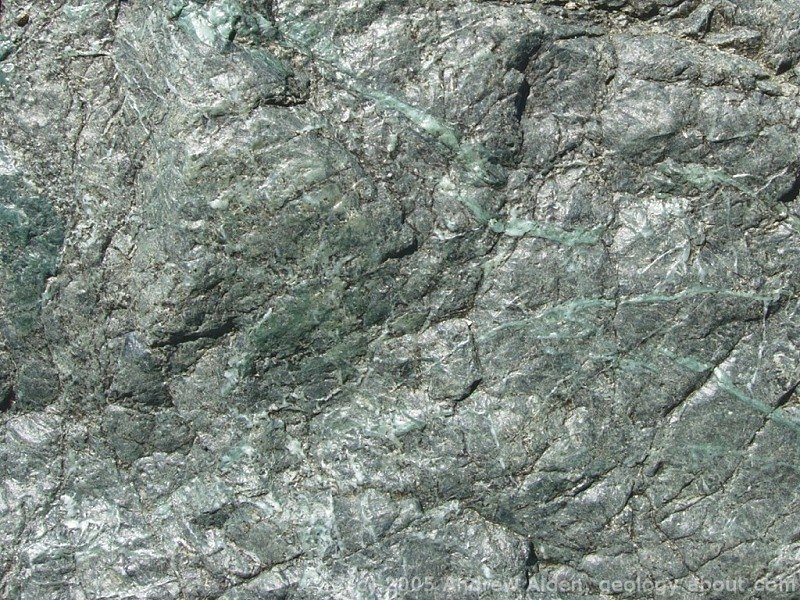 Serpentine is widespread in California where it is the state rock. Here is a photo of serpentine along a beach. To read more about serpentine and see more examples, click here. If you have a comment about this post, either click the cartoon balloon in the upper right hand corner of this post or the Leave a Reply link at the bottom of the post. However, if you have a new question, please contact us through our website.